To begin, it is helpful to briefly mention several of the basic assumptions of materialism that establish the foundation for the current description of big history. ‘Materialism’ is the belief that only physical reality truly exists and nothing else. In this view, all things are composed of physical matter and all phenomena, including consciousness, are the result of mechanical interactions of matter. Physical matter is regarded as the sole cause of every possible occurrence, including human thought, feeling, and action. In this view, the universe is dead at the foundations—inanimate, mindless, and without consciousness. Materialism contrasts with the living systems view that there is vastly more to reality than interactions of physical matter. For example, given recent findings that 95 percent of the known universe is non-material and invisible, it implies that materialism applies to only a very small fraction of the overall universe. The idea of a ‘living universe’ is not a new perspective. More than 2,000 years ago, Plato described the universe as a single living creature that encompasses all living creatures within it. In this view, we live within a living system of unfathomable intelligence, subtlety, power, and patience. In turn, we appear to be evolving expressions of that living universe, infused with a knowing capacity or consciousness and with an existence that is largely non-material in nature. In what ways does our universe function as if it were a living system? There is not the space in this short essay to do more than gesture toward the beginnings of answers to this provocative question. However, summarized below are five attributes of our universe that point to a ‘living systems’ perspective rather than a non-living perspective. 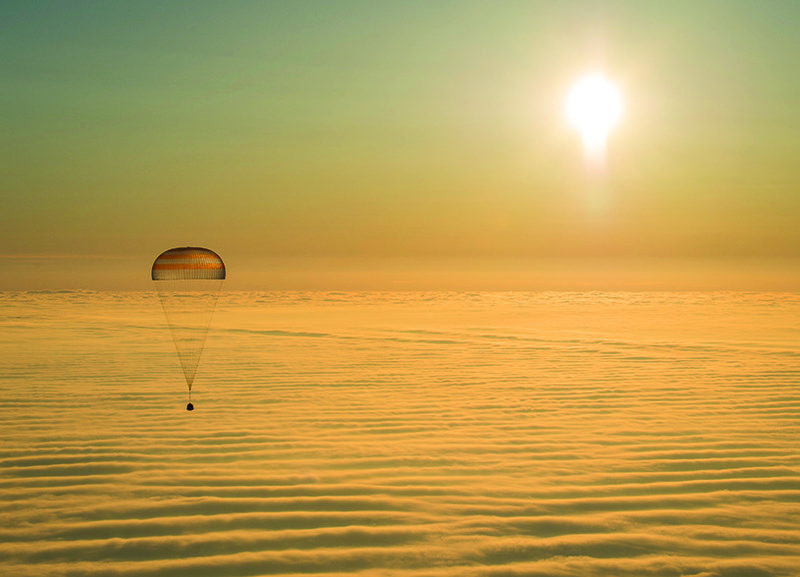 After six months in the International Space Station, members of Expedition 41 and 42 return to Earth by parachute in Kazakhstan. Scientists used to think that empty space was completely ‘empty.’ However, scientists have now discovered there exists an extraordinary amount of background energy permeating the universe. Empty space is not empty. David Bohm calculated that a single cubic centimeter of ‘empty space’ contains the energy equivalent of millions of atomic bombs. We are swimming in an ocean of subtle energy of such immense power that it is virtually incomprehensible. The universe is not static. Despite outward appearances of solidity and stability, the universe is a completely dynamic system. In the words of the cosmologist Brian Swimme, “The universe emerges out of an all-nourishing abyss not only 14 billion years ago but in every moment.” At every moment, the universe is being created as a single orchestration of manifestation. Because nothing is left out of the process of continuous creation, we are participants in a cosmic scale process whether we are conscious of it or not. The entirety of this great cosmic body of being, including the fabric of space-time, is continuously re-created at each instant. The mathematician Norbert Wiener expressed it this way, “We are not stuff that abides, but patterns that perpetuate themselves; whirlpools of water in an ever-flowing river.” Max Born, a physicist who was instrumental in the development of quantum mechanics wrote, “We have sought for firm ground and found none. The deeper we penetrate, the more restless becomes the universe; all is rushing about and vibrating in a wild dance.” If all is in motion at every level, and all motion presents itself as a coherent and stable pattern, then all that exists is a singular orchestration. All flows comprise one grand symphony in which we are all players, a single creative expression—a uni-verse. With increasingly sophisticated tools, scientists are finding a spectrum of consciousness ranging from what might be called primary perception at the atomic and cellular level to a capacity for reflective consciousness at the human level. From the atomic level to the human scale and in between, we find a capacity for reflection and choice that is fitting for that scale. As these examples begin to illustrate, if some form of consciousness is operating at the level of atoms, molecules, and single-cell organisms, then it seems wise to open to the possibility that ‘consciousness’ is a very sophisticated, invisible, and basic capacity that is manifest at every level of the universe and has been an integral aspect from its beginning. 5. Freedom at the Foundations—Uncertainty, and therefore freedom, is fundamental to a quantum view of the universe. Quantum physics describes reality in terms of probabilities, not certainties. Uncertainty and freedom are built into the very foundations of material existence. No one part of the cosmos determines the functioning of the whole; rather, everything seems to be connected with everything else, weaving the cosmos into one vast interacting system. In turn, it is the consistency of interrelations of all the parts of the universe that determines the condition of the whole. We therefore have great freedom to act within the limits established by the larger web of life within which we are immersed. Summarizing, there is scientific support for regarding the universe as a unified system that is sustained continuously by the flow-through of phenomenal amounts of energy and whose essential nature includes consciousness or a self-reflective capacity that enables systems at every scale of existence to exercise some freedom of choice. While these scientific properties do not ‘prove’ the universe is a living system, they clearly point in that direction and invite a much deeper inquiry into how a living systems perspective could manifest in big history. What value does a living systems perspective contribute to big history? Importantly, a living systems paradigm includes the co-evolution of culture and consciousness as an important aspect of the human journey. Through history, humanity’s capacity for self-reflective consciousness has developed progressively—from the magical world of the hunter-gatherer, to the nature-based world of the agrarian farmer, then into the dynamic world of the urban-industrial society, and now into a holographic perspective and collective consciousness rapidly awakening within our global brain. In the paradigm of scientific materialism, we are no more than bio-chemical beings—evolutionary accidents whose consciousness and aliveness are ultimately separate from the rest of the non-living and unconscious universe that surrounds us. In contrast, from a living systems perspective, we are both biological beings and cosmic participants in a vast field of life-energy. Our identity is immeasurably deeper and larger than imagined by scientific materialism. Physicist Brian Swimme explains that the intimate sense of self-awareness we experience bubbling up at each moment “is rooted in the originating activity of the universe. We are all of us arising together at the center of the cosmos.” We thought that we were no bigger than our physical bodies, but now we are learning that we are participants in the flow of continuous creation of the cosmos. Awakening to our identity as simultaneously distinct and intimately interconnected with a living universe can help us transform feelings of existential separation and species-arrogance that threaten our future. A non-living universe is not conscious and is therefore oblivious to any sense of human purpose. As existentially separate life-forms, we may strive heroically to impose some reason for our existence on the universe, but this is ultimately fruitless in a cosmos unaware of life. In dramatic contrast, a living universe is intent on growing self-referencing and self-organizing systems within itself at every scale. We are expressions of aliveness that, after nearly 14 billion years, enable the universe to look back and reflect upon itself. A living universe paradigm brings a profound shift in our evolutionary purpose: We are moving from seeing ourselves dropped into a fragmented and lifeless cosmos without apparent meaning or purpose to seeing ourselves on a sacred journey within a living and unified cosmos whose purpose is to serve as a learning system. We are agents of self-reflective and creative action who are engaged in a time of great transition and conscious learning. If the universe is dead at its foundations, then in its depths it has no feelings for us as human beings nor does it offer a sense of meaning and purpose. Because a nonliving universe is unconscious at its foundations, it is indifferent to humanity and unknowing of our evolving creations and conditions. Nothing will ultimately matter to non-living matter. All will be forgotten. An old saying goes, “A dead man tells no stories.” In a similar way, “A dead universe tells no stories.” In contrast, a living universe is itself a vast story continuously unfolding with countless characters playing out gripping dramas of awakening. With regard to feeling, how we experience ourselves within the surrounding universe has an enormous impact on our approach to life. If we regard the universe as dead at the foundations, then feelings of existential alienation, anxiety, dread, and fear are quite reasonable. Why seek communion with the cold indifference of lifeless matter and empty space? If we allow ourselves to drop into life, won’t we simply sink into existential despair? However, if we live in a living universe, then feelings of subtle connection, curiosity, and gratitude are understandable. We see ourselves as participants in a cosmic garden of life that the universe has been patiently nurturing over billions of years. A living universe invites us to shift from feelings of indifference, fear, and cynicism to feelings of curiosity, love, awe, and participation. In a non-living, bio-mechanical cosmos, we are existentially isolated entities whose being stops at the edge of our skin. In turn, it is rational that our scope of ethical concern would not extend much further than ourselves, our family, and others on whom we depend for our wellbeing. In contrast, a larger scope of ethics can emerge from an intuitive connection with a living universe that provides us with a ‘moral tuning fork.’ We can each tune into this living field and sense what is in harmony with the wellbeing of the whole. When we are in alignment, we can experience a positive hum of wellbeing as a kinesthetic sense that we call ‘compassion.’ In a similar way, we can also experience the dissonant hum of discordance. When we are truly centered in the life current flowing through us, we tend to act in ways that promote the wellbeing and harmony of the whole. In a dead universe, consumerism makes sense. In a living universe, simplicity of living makes sense. On the one hand, if the universe is unconscious and dead at its foundations and each of us is the product of blind chance among materialistic forces, then it seems fitting that we, the living, exploit on our own behalf that which is not alive. If most of the known universe is lifeless, then it has no deeper purpose, meaning, or value. It is only natural, therefore, that we focus on consuming material things to minimize life’s pains and maximize its comforts. How do we know we ‘matter?’ By how much matter we have in our lives: a big house, a big car, a big bank account, and so on. In this view, the more matter we have, the more we must matter. An alternative view is that if the universe is uniquely conscious and alive, then we are the product of a deep intelligence that infuses the entire cosmos. We shift from feelings of existential isolation in a lifeless universe to a sense of intimate communion within a living universe. If life is nested within life, then it is only fitting that we treat everything that exists as alive and worthy of respect. In turn, the search for a meaningful way of life shifts from a desire for high-consumption lifestyles and toward simpler ways of living that enable us to connect more directly with a living universe of which we are an integral part. In a living universe, it is only natural that people would choose simpler ways of living that afford greater time and opportunity for connecting with the aliveness of the world in meaningful relationships, creative expressions, and rewarding experiences in nature. In conclusion, as a provisional paradigm, a living systems perspective brings with it a transformed description of our cosmic identity, purpose, meaning, consciousness, and ethics, as well as a compassionate concern for sustainable ways of living. These are of immeasurable value to humanity as we seek to grow consciously through a time of profound planetary transition and come together to build a promising species-civilization. 1 See The Living Universe: Berrett-Koehler, 2009; www. duaneelgin.com/wp-content/uploads/2014/11/Deep-Big-History-A-Living-Systems-Paradigm.pdf; “The Living Cosmos: A Theory of Continuous Creation,” ReVision, Summer, 1988; Rupert Sheldrake, Science Set Free, Crown Publishing, 2012; Thomas Nagel, Mind and Cosmos: Why the Materialist Neo-Darwinian Conception of Nature is Almost Certainly False, Oxford University Press, 2012, p. 85; Robert Lanza with Bob Berman, Biocentrism: How Life and Consciousness are the Keys to Understanding the True Nature of the Universe, Benbella Books, 2009.